Dwarves are known for their unstoppable greed. It’s a curse that follows their entire culture since eons back. It affects more commonly the dwarves who still live mostly underground. Their thirst for digging deeper and deeper to uncover the secrets and treasures in the stones. Due to this behavior, they are also experts in keeping what they have found safe. This is a cave that ages back, was mined by a dwarf clan, Clan Torchbeak. Because of clan conflicts back in their mountain ranges, they had to go and never came back to this place. They left some trinkets and tools all over the place, but nothing really of value; except what they hid in their treasure room. There are to accesses to this mine, the old elevator winch that can be found inside a cave, the PCs might stumble upon it by coincidence. The elevator doesn’t work but can be repaired. A thieves’ tools check or Intelligence check (DC 15) and four hours of work achieve this goal. The other access was built by kobolds mining away from their lair. They found the dwarven mine by accident and have already sacked most of it, except the treasure room. They don’t know how to open the door. Outside their lair tunnel, they placed two defensive ballistas. Kobolds can randomly attack in any location of the mine. Other underground denizens are good ideas for encounters in this mine. For example, anytime a PC examines a pile of rocks, an ore box or ore cart; a swarm of insects or rats jumps to attack. There are two pit-traps in the main mine. Both reset themselves automatically after an hour of being triggered. The treasure door is metal reinforced. It can be opened with the key, which is hidden in a chest at the bottom of the pit, near the kobold’s cave. The dwarves would use a pair of magical climbing boots to easily access the key. In the treasure room, the treasure is suspended in a platform. A magical panel can be used to lower the platform for access. If someone climbs on top of the platform without lowering it, the cable holding it snaps and everything falls down the pit, never to be seen again. If the platform is lowered with the panel, climbing on it is safe. You can find this map in High Resolution PDF with and without area names, in my patreon account. It also includes D&D 5e stats for the different traps and doors, and suggestions for treasure. My mapping ventures are funded through Patreon, It is thanks to people who like my work that I am able to continue mapping and providing RPG original experiences to people all over the world. If you like what I do, consider getting involved and backing me. 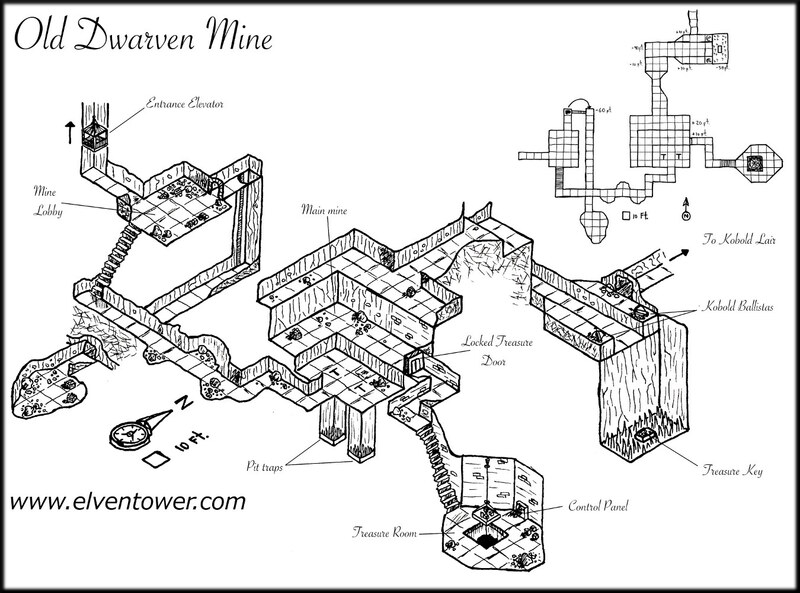 What you get is impressive hi-def versions of my maps to be used in your RPG games (these have lower resolution), and the satisfaction of helping the rpg community grow bigger and stronger. Help me get funding and enjoy hi resolution PDF version of my work.